Leaseweb is always striving for the best customer experience and we believe that putting you in the driver’s seat is a key factor in this. After all, the more control you have, the faster you can get things done. To help you with this, we automate important self-service processes that enable you to manage your infrastructure. All these actions are made much easier by giving access to the IPMI interface. 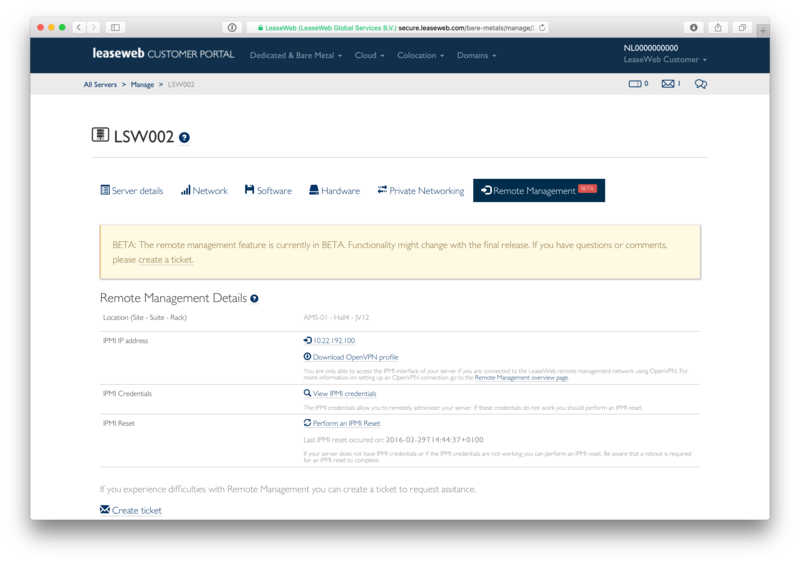 Leaseweb already offered access to the IPMI interface on request by assigning a public IP address so it would be accessible over the internet. However, IPMI interfaces are not known for their security, so exposing them over the internet is far from ideal. That’s why, during the past year, we invested in our core network infrastructure to be able to offer secure IPMI access through an internal private network which we refer to as ‘The Remote Management Network’. People with an existing IPMI device on a public IP address are encouraged to switch to the new secure Remote Management Network. Please contact one of our sales representatives to start this process. You connect to the remote management network by setting up a VPN connection. The technology we use is OpenVPN. It is open source, secure and there are clients available for every operating system. If you have dedicated servers in multiple Leaseweb data centers you need to establish a VPN connection per data center. 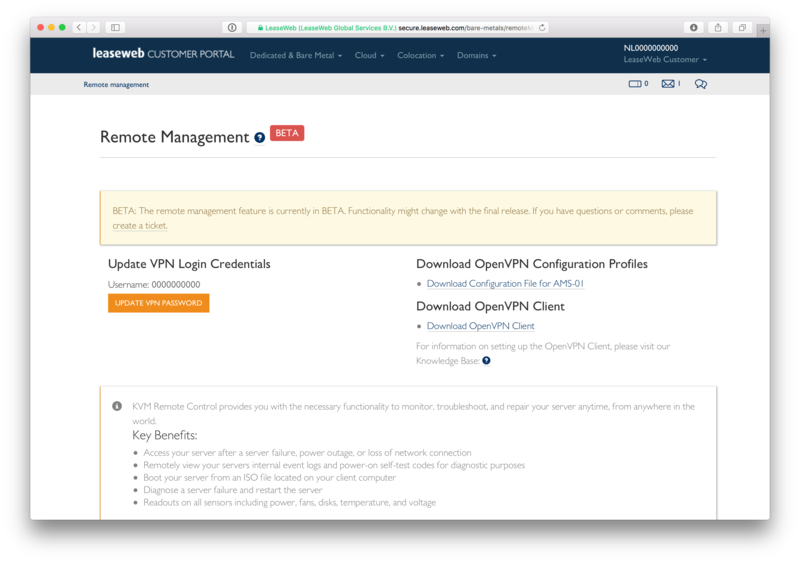 You can download OpenVPN connection profiles to establish these connections when logging in to the Leaseweb Customer Portal. To see if Remote Management is available for your dedicated server, simply go to the server management page and click the Remote Management tab. If Remote Management is available, you can view the IP address and credentials for your server’s IPMI interface. Otherwise, simply contact one of our sales representatives to check the available options. We’re very excited to offer you this new feature. Now we would love to hear from you about how you think we could make it even better – or what other options you’d like to have to manage your servers!